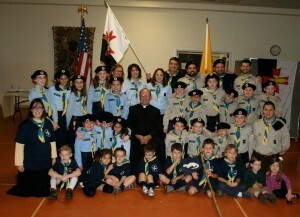 2012 November | Federation of North-American Explorers | Semper Parati! 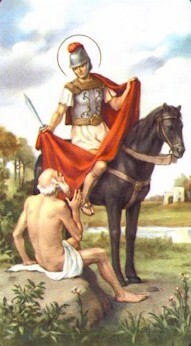 Our Saint of the month for November is St. Martin of Tours. He was born around 316 AD in modern day Hungary and died in Tours France around 397. Martin’s father was Roman military officer and Martin likewise joined the Roman army. The most common St. Martin story is that he once cut his cloak in half to give to a poor man so he wouldn’t freeze. Later St. Martin had a dream where he saw Jesus wearing the half cloak he gave to the beggar. After that he left the army and entered monastic life, where he lived quietly until he was coaxed into being bishop of Tours. Lured away from his abbey, Martin was accosted when he entered the town. He made a break for it and tried to hide in a barn, but the noise of the geese gave him away. He finally assented. Martin was a model bishop. He planted Churches all over France, and visited all his parishes once a year. He was beloved by his people and worked many miracles to spread the true faith in the face of paganism. Another story of St. Martin is that he was once traveling on perilous roads through the mountains. He was attacked by robbers and bound as a prisoner. One robber was left to guard him while the others looked for more victims. The robber asked Martin if he was afraid. Martin replied that he felt absolutely calm, and trusted his fate to Jesus. He continued to tell the robber about our Lord, and before long the robber converted and released Martin. The feast of St. Martin used to be known as Martinmas. Celebrations were quite festive, featuring many of the fruits of the harvest (including newly made wine) due to its proximity to harvest and wine making time. Goose is the traditional meal for the day. In medieval times a period of fasting would begin after Martinmas in preparation for Christmas in some places (mainly France), so Martinmas had a sort of Carnival feel to it. Other traditions including processions, singing Martinmas songs, children going around with paper lanterns in the evening asking for candy (kind of like trick or treating), making bonfires and wine tasting (it’s probably best to keep the last two separate). Please see the FNE website for a letter from our General Commissioner Paul Ritchi on the occasion of our first anniversary in the USA.